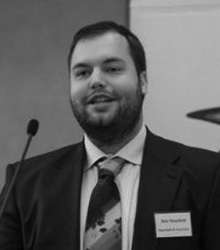 Bob brings experience in the field of International Consulting and Research. Working out of Budapest, Hungary, he provides research, recruiting, and consulting services throughout the European market within the manufacturing, banking, financial, pharmaceutical, laboratory, biomedical, health care, enterprise software, sports, hospitality, and retail fields. He has worked in Hungary and Serbia for the Simonyi Consulting Center, focusing on entrepreneurship, commercialization and innovation. In addition to his consulting and research work internationally, he has been affiliated with the George Voinovich School of Entrepreneurship and the Appalachian Regional Entrepreneurial Group with Ohio University serving small businesses in the Appalachian Region, Ohio and West Virginia. Bob’s diverse experience working with European business owners and entrepreneurs is a valuable asset in understanding the changing international business model and its impact on national companies looking to expand utilizing a worldwide talent pool. Bob has earned a BA in European History with a focus on Russian Language and International Business Consulting from Ohio University.